Enjoy the benefits of a smooth, natural stride with the SIXstar Certified EX-59. The Sonic Surround speakers with MP3 compatibility, COOLfit fitness fan, and rubberized footpads make workouts more enjoyable while 10 different programming options take your fitness to the next level. The Elite E7 is one of the best moves you can make when you’re ready for more advanced training. Power incline adds challenge at the touch of a button, and Polar heart rate (free Polar® Chest strap included) monitoring makes it easy to stay in your target zone. When you want both advanced training features and truly innovative entertainment, the Elite E9 is the perfect elliptical for you. You’ll notice the smooth, fluid motion due to the heavy flywheel, and you can escape to exotic locales with the immersive, forward-motion Virtual Active videos that are synced to your workout and play right on your console. 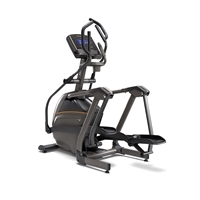 The original Octane elliptical just keeps getting better, delivering the form, function and results that exercisers want. The new Q35c features contact heart rate monitoring and an enhanced X-Mode workout booster to let you get even more out of your workout. From the natural fluid motion of Body-Mapping Ergonomics™ and the QuadLink drive to the informative electronics and variety of pre-programmed workouts, this elliptical gets you moving and seeing results in no time. Experience a harmony of design and natural movement on a comfortable, smooth-moving elliptical with a compact design that will fit your home like no other. Suspension Elliptical™ Technology features a wheel- and track-free design to reduce noise and friction for long-lasting quality while providing a smooth, consistent feel through the ellipse. The Zero Runner cracked the code to replicate real running motion with zero impact. Incorporating the Zero Runner into your training schedule allows you to continue to add the miles but without the impact on your joints. The pedals are independent so you have free motion and flexibility to create a customized stride to walk, jog or run that feels best to your body. The patented hip and knee joints on the Zero Runner facilitate this custom motion and natural stride – you can replicate exactly what you do outside. One of the best ways to stay injury-free during your running or workout program is to cross train. Whether you’re a walker, exerciser, weekend warrior or ultra runner, everyone can benefit from cross training on the Zero Runner to reduce the risk of getting injured. Cross training varies the stresses to the body so that overall conditioning improves and you strengthen your weak links. Plus, cross training can decrease the tendency to overtrain by incorporating balance and variety, so you can stay injury free and keep working toward your goal. The sleek, curved profile of the M50 elliptical brings a modern, polished look to home cardio equipment. Featuring ergonomic multi-grip handles, and orthopedic cushioned footpads, the M50 elliptical is equipped with premium user-focused features. Paired with TRUE's legendary patented Heart Rate Control technology and HRC Cruise Control, the new M50 elliptical truly maximizes your fitness investment and with one of the smallest footprints on the market, it’s a great choice for the space-conscious consumer. Experience a harmony of design and natural movement on a comfortable, smooth-moving elliptical with a compact design that will fit your home like no other. Suspension Elliptical™ Technology features a wheel- and track-free design to reduce noise and friction for long-lasting quality while providing a smooth, consistent feel through the ellipse, and our exclusive Exact Force™ Induction Brake (E50 only) offers smooth, precise resistance changes at the touch of a button. The Q37 Series is ramped up and ready to take you and your workout to the next level. See the results you have been trying to find for years…better results in less time with the redefined Octane Q37. The Q37 features a low step-up height, close pedal spacing so your body is positioned ergonomically correct and the smoothest motion you can find for your home!